How well do you feel your supervisors uphold and maintain your policies? Quality training of the people on the front lines is vital to properly executing your drug and alcohol testing policy. Supervisors who know how to recognize the specific, observable behaviors of an impaired employee are your first line of defense in creating and maintaining a drug and alcohol-free workplace. We team with our clients to determine the best solutions for your needs. Learn more about the different types of testing we offer. Transmetron offers certification for DOT urine drug screen collection as well as certification for DOT breath alcohol technician. We also offer training for individuals or companies that are non-DOT regulated, but want serious in-depth training. 8 hour course that covers all parts of the New DOT 49 CFR Part 40 drug and alcohol testing regulations. A full one day overview of the new DOT rules and regulations for drug and alcohol testing. A copy of the new regulations will be provided. Discussion on major DOT policy issues including validity testing, public interest exclusion and stand-down. Review of new drug and alcohol testing forms (mandatory use August 1, 2001), test protocols, and laboratory procedures. Other topics include the role of the Medical Review Officer and Substance Abuse Professional, and more. Participants are encouraged to invite their industry colleagues. 6 hour course that meets and exceeds the DOT requirements for urine collection. A six hour course designed to comply with new DOT regulations pertaining to collectors. New DOT rules require all collectors undergo basic knowledge and qualification training plus proficiency training. Collector refresher training will be required every five years thereafter, and error-correction training is required if the collector makes an error that causes a DOT drug test to be cancelled. Mock collections shall be performed according to DOT requirements. Each person must bring at least (7) copies of the new HHS Federal five-part Custody and Control Form in use by their laboratory and (7) corresponding sealed split specimen collection kits. A permanent copy of the collector certificate shall be maintained by Transmetron, and the collector shall be notified when future refresher training is required. 6.5 hour DOT BAT Rules & Regs Training Course - meets DOT requirements for Units 1-7. Unit 8 EBT Training separate. 5 hour DOT STT Rules & Regs Training Course - meets DOT requirements for Units 1-6. Unit 7 Device Training separate. 4 hour Supervisor Training Course on recognizing signs and symptoms of drug and alcohol abuse that exceeds DOT requirements for supervisor training. 2 hour course includes time for questions from employees about alcohol and drugs. 4 hour Supervisor Training Course on recognizing signs and symptoms of drug and alcohol abuse. 2 hour course include time for questions from employees about alcohol and drugs. Customized to company policy. 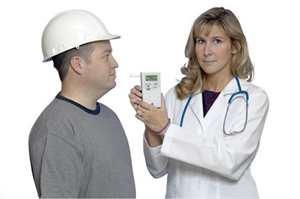 6 hour evidential breath test training for non-regulated companies. What Our Courses Are Not! Other companies may offer training that contains flat graphics, stale presentations, and boring read-the-screen text. Certificates can be generated without a true assessment of the learner’s knowledge in the subject matter. Accountability is minimal. Follow-up doesn’t exist. Our courses are different! Our web / internet based training is unique, engaging, and memorable. Each course is truly interactive. Self-paced courses include rich multi-media, interactive animations, and strong instructional design rooted in industry regulations and practices. All certificates are PASSWORD protected and individualized records are permanently maintained. WHEN WILL I GET A CERTIFICATE? Following completion of the web - internet based course and Final Exam you will receive a printed Certificate indicating the completion of the web based portion of the class. A copy of certificate can be sent to your employer. You will be notified when your certificate is due for renewal. You will receive an email confirmation of the training, along with pre-class study materials. For web - internet based training, you will receive a link to the on-line training course (passkey is required). For classes that require mocks in real time (DOT: UDS, BAT & STT), you must schedule a 4 hour web cam mock observation. Upon completion of the class requirements, you will receive a Certificate of Training showing that you have been certified! Ordering by Fax or Mail: You may view and print our Drug Test Training Course Order Form. Order Forms must be completed by enclosing a check, money order, or credit card. No PO’s accepted.